My favorite Rokkaku kite is no more. Cats have nine lives…..kites…. only 5. Yes – this kite has been stuck in tall trees 5 times. The 5th time proved to be costly. No KAP rig on the line…. thankfully. 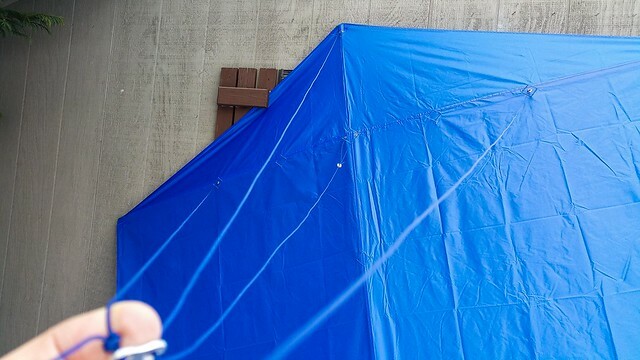 The Blue Kite Team 8 foot Rokkaku has been one of my favorite kites. 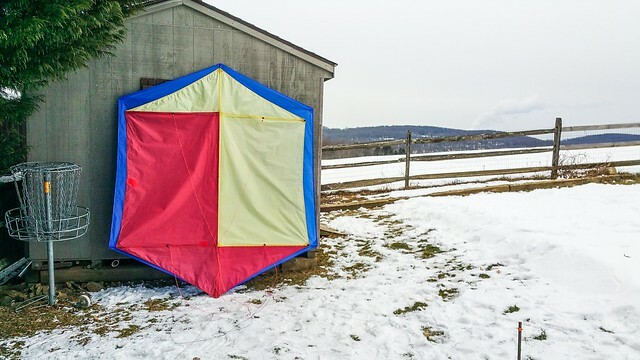 I kept the kite fully assembled and ready to fly in the (kite) shed in my back yard (Wind Watcher Proving Grounds). Piotr Mądry of BKT used a very light kite fabric for this fine kite. Even before this kite left the ground for the first time in April 2012 I knew this was going to be a special flyer. 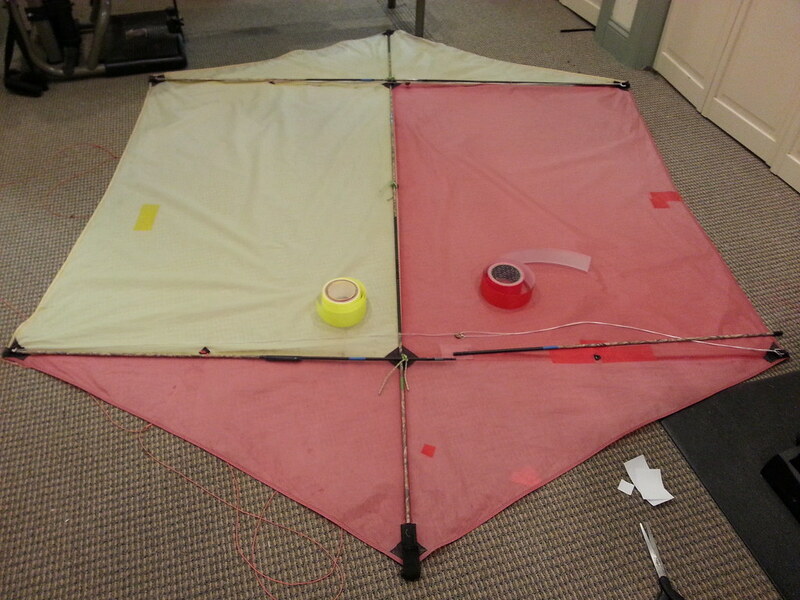 Over six years ago this kite was bright red and yellow in color. The color scheme was selected for high visibility (given my frequent encounters with helicopters…). Over the years the color gradually faded. Multiple tree rescues resulted in numerous patches to the kite sail….. 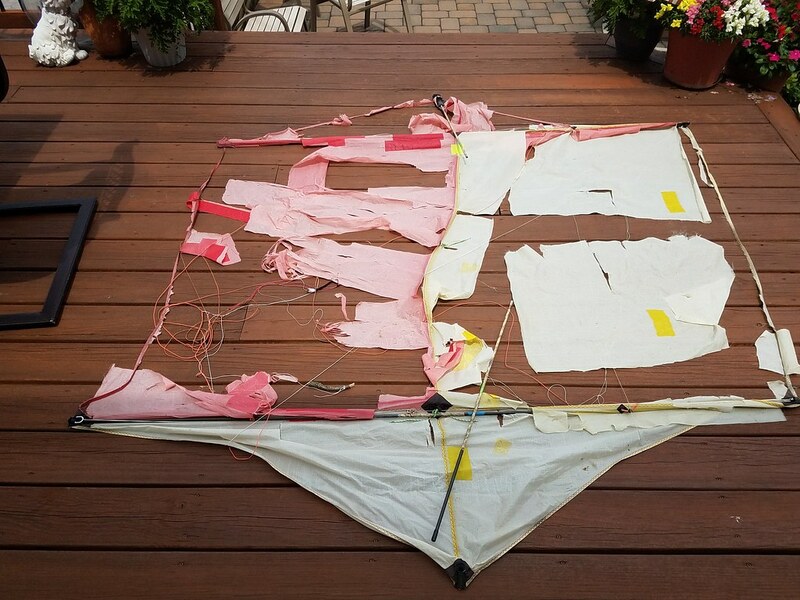 The extend flying time over the Wind Watcher proving grounds took its toll as the solar UV radiation gradually weaken the kite fabric. A few run ins with trees did not help he cause either! This kite averaged over 50 fights (most over 8 hours in duration) per year. I typically put kites in the air as soon as the wind comes up in the morning and do not take the kites down till dusk. Doing the simple math …. 50 flights per year X 6 years = 300+ flights. I will miss this kite…. How did this happen? Simple. The wind briefly and unexpectedly stopped. The kite was flying great in a steady but gentle North wind blowing ~10 mph. As I put this kite in the air….I had a feeling…this may be the last flight for this kite…. As is my standard practice for flying kites over the WW proving ground, I attached a number of colored streamers to the kite line. Main purpose is to alert me if the kite begins to drop so I can quickly rescue the kite. As with past failures (trees eats kites) I am the root cause for the disasters…. I trust the wind ….. too much. After tying off the kite….I proceeded to hop in my car and run a few errands. Upon returning to my home….my eyes always start searching the sky for my kites high in the sky. About ½ mile from my home … not seeing the kite….I began to get a sinking feeling. Turning onto my street….with no kite in sight….I knew I was doomed. I quickly located the kite….in the top of a 120’ poplar tree. The tree was located in one of my neighbor’s yard….same neighbor where I rescued one of my Levitation Light delta kites earlier in the year! Turns out my neighbor was working on an addition to his home and the tree was above this construction area and I could not get access to recover the kite till the construction was complete (projected to be 2-3 weeks). I was still hopeful the winds would shift and move the kite out of the tree….. Several days passed but no movement in the kite (still stuck firmly high in the top of this big tree). Each day for the next few days as I drove past my neighbor’s home I would observe the kite ….. still firmly stuck in the tree….. a mix of hope and embarrassment flood though my mind. As I drove past my neighbor’s home I looked up expecting to see my faded Rokkaku kite still stuck in the tree….but it was gone…..a mystery…..but not just the kite…..the 120 foot TREE was also gone! It took a few minutes for my brain to reorient itself….no kite…..no tree…..
Perhaps these BKT Rokkaku kites are more powerful than I know! Turns out the neighbor decided to take the tree down as it was leaning over his home. A crew of Amish tree specialist has been working in the neighborhood taking down tall trees that could threaten homes in storms. I quickly walked over to my neighbor’s yard to inspect the damage. The massive tree was now stretched out on the ground mashed together in utter chaos with a number of smaller trees. I climbed through the wreckage looking for any trace of my fragile Rokkaku kite. After a few minutes of searching I came across my kite line (fresh Dyneema kite line from my new Stratospool kite reel)…..but no kite was to be seen. I then spoke with the Amish work crew and asked did you see a big 8 foot kite in the top of the tree. The two workers said yes! They directed me to where the top of the tree hit the ground about 150 feet from where we were standing. 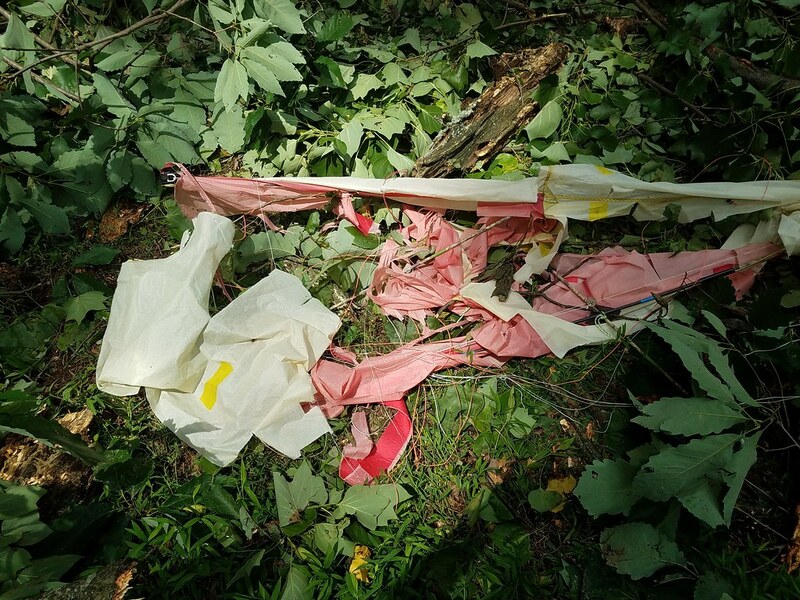 A few short minutes later I spotted the shattered remains of my favorite Rokkaku kite…..
Not surprised by the kite damage given the chaos on the ground from the massive tree drop…..I knew this kite would never fly again…. I gathered the kite bones (Skyshark wrapped carbon frame) and fragments of the kite sail that remained and headed home. The BKT Rokkaku kite had a full and exciting life over the Wind Watcher proving grounds and will be dearly missed…. Enjoy a few pictures below capturing this fine kite from early April 2012 to the current state….and a few more in this flickr album. 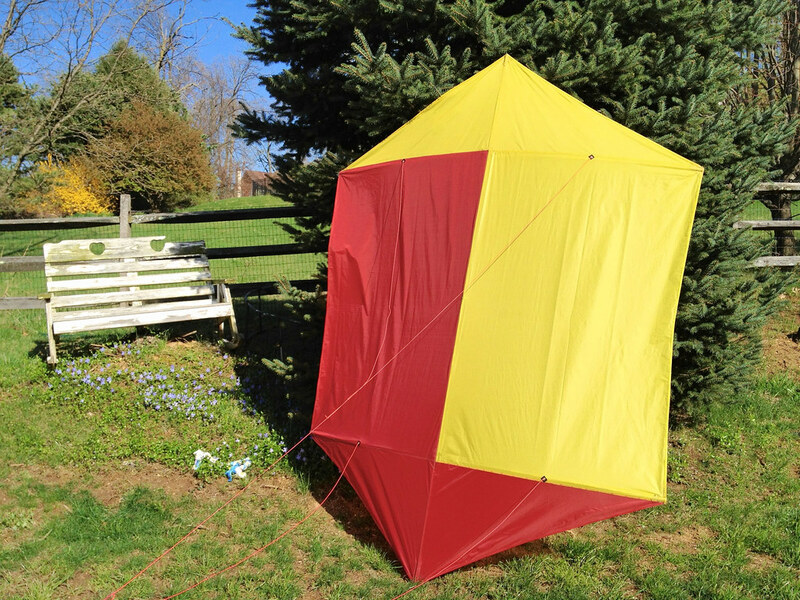 Now….I need to replace this fun filled kite….. Piotr….I may reach out to your again! If Sandro is able to pitch -in, I may join the queue. Piotr has given us something to aim for. thanks Sandro for compliments. A Propos very "armored kite", this idea makes me very discouraged to further design and sewing. Making extremely strong pockets, require a special machine with high punching force. My friend from Milano jets has several of them. To sew a good kite it is not enough good intentions, you need to have some experience. Our colleague SMAC makes kites, almost 40 years without a break. This is besides his loved ones, his greatest love. Yes I am interested in replacing my 8' BKT Rokkaku! 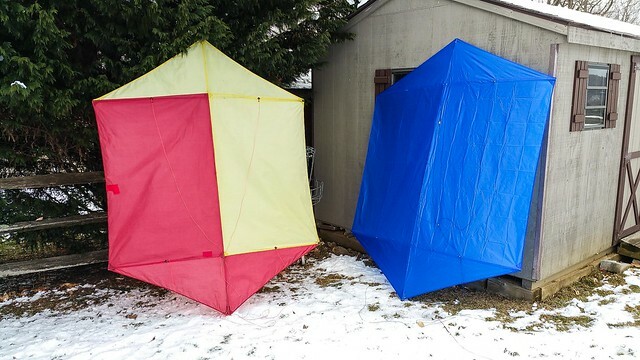 But I do have a good back up plan for the near term..... a couple of years ago....in anticipation that one day my red and yellow 8' Rokkaku would be no more.... I asked Piotr to make me a replacement..... a true blue BKT 8' Rokkaku that came with a special 6 point bridle. I am now flying with the blue BKT Rokkaku but with the simple 4 point bridle. As shown the photos below the blue Rokkaku is a bit wider and this places a bit more stress on the horizontal spreaders.